"I definitely pushed my playing further than it’s ever been." 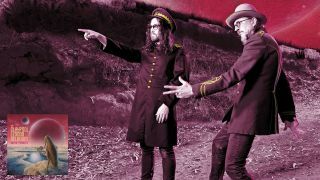 The Claypool Lennon Delirium is the ongoing musical collaboration between Primus bass legend Les Claypool and multi-instrumentalist Sean Lennon, who also frequently records and tours with his partner, Charlotte Kemp Muhl, as the Ghost of a Sabre Toothed Tiger. The Delirium’s music is often as otherworldly as their latest press photo (see above) and album cover art for South of Reality, their first full-length studio album in three years. With strong elements of prog rock and psychedelia and a streak of Frank Zappa-meets-Captain-Beefheart humor running through a lot of the songs, there’s so much going on that it takes a couple of plays to really get into the duo’s headspace. Of course, it’s a given that Claypool always brings his killer bass chops to the table, but what’s probably less well known is that Lennon is a very strong guitarist in his own right. I recently spoke to Lennon about the new disc and, of course, that famous last name. How did you guys prep for South of Reality? We’d both bring in about three or four ideas, but not completed ideas. We like to leave things open. And then we’d jam quite a bit. By the time we got into the studio, we had a solid set of about 10 songs to work on. We played everything between us, except drums on a few tracks. Does working with someone like Les make you really step up the practice regime in anticipation? Yeah, he really pushes me a lot on all instruments, even keyboards. But I definitely did do some practice. It’s almost like an athletic gig! I found myself doing scales, you know? It’s a whole other level with Les, but I definitely pushed my playing further than it’s ever been. When I was about 12. I’d been into the Stones and the Beatles and a lot of classic rock. Hearing Jimi Hendrix for the first time was a major turning point. I bought a cassette with Are You Experienced on one side and Axis: Bold as Love on the other. I listened to those albums for about a year non-stop and learned all the songs. I’d say he was the main influence that’s underpinned all my playing. “Easily Charmed by Fools” is the album’s obvious single — at least in my opinion. There’s a great sense of humor in that song. Yeah, that was one that Les brought. I suppose I have no idea what a single would be these days. There’s no real obvious radio station that we’d fit into, but it definitely could be a single — though I’m not sure in what universe! It must be difficult to follow your own musical path when inevitably people will always compare the work you do to that of a famous parent — or parents in your case [Sean is the only child of John Lennon and Yoko Ono]. Does it ever get frustrating? It’s a difficult question because people seem to have so many preconceptions about me. Also, you think maybe someone’s interested in you because of your parents or even sometimes the opposite kind of reverse thing, where people will be deliberately resistant to what you’re doing because they think you’re “privileged.” This is the only reality I know; I don’t have anything to compare it to. I do think there’s often a built-in cynicism about me, but I’m happy to admit the music I make isn’t the most commercial in the world. You either like it or you don’t! I’m sure I’ve had opportunities because of who I am, but at some point there has to be something I’m offering that’s more than just my family connections to have taken me this far.